We all have our own style. That is half of the fun of riding a motorcycle. Some of us like simple and subtle, others like a little more flash. In designing the new N104 EVO helmet, Nolan has kept both sides of the equation in mind. 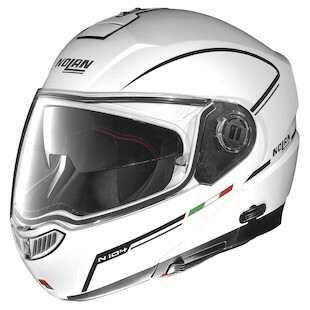 Built to the same specs as the N104 Solid & Hi-Viz options, the Nolan N104 EVO Tech Helmet, makes use of an improved ventilation system and advanced chin guard geometry to support a highly comfortable ride through a variety of conditions. Coming in a variety of colors (White, Blue, Black, Red, and Yellow), the Tech Helmet incorporates a Silver mesh pattern and White outline around the face shield to offer a slightly more unique experience than a solid color alone. While the graphic is the same as that on the original N104, the guts of the helmet have been redesigned for a better fit and control of the internal climate. 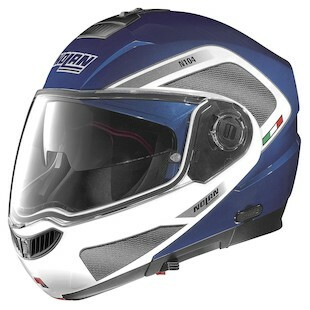 If the Tech Helmet isn’t your style, the Nolan N104 EVO Storm offers the identical advancements, yet with a more subdued graphic. This one lands halfway between the Solid options and the Tech graphic on the spectrum. As it comes in either Black or White, the Zoro-like pen stripe conveys a feeling of motion while the jawline is augmented with an angular line that pulls from the chin to the back of the helmet. No matter what you prefer, solid, subtle and sophisticated… or sleek and slightly edgy… the re-designed Nolan N104 Evo has something to cater to your tastes!